It would be easy to imagine that in 2013 the PCs have advanced enough that a slow onset of PC and computers that do not respond or blocked were things of the past. Sadly , this is not the case. 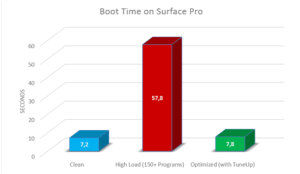 Although Windows 8 and the arrival of SSDs have accelerated the start of our teams, ultrabooks and tablets , there are still factors that cause a slow PC , which means that performance worsens and grow timeouts . Some of these factors are , first mechanical hard disks , ie , the traditional hard disk that is used in most computers with Windows XP, Vista and Windows 7 because they need more time to gather information and PC starts slowly. Second, third-party applications are installed they slow down even a modern PC. It is shown that the more programs you install on your PC slower the startup folder . Probably one of the easiest and quickest ways to turn an additional burden as you start your PC. You can use our own tool management startup programs , TuneUp Startup Manager , included in TuneUp Utilities 2013. This tool displays only the programs that run automatically when you start the PC and can be disabled safely . It is an excellent program for users and professionals of any level of computer knowledge. 1. Download and install TuneUp Utilities. Go to ” Optimize Computer ” and select “Disable startup programs ” . 2. In the next window , you will find a list of all programs that are loaded on every Windows startup . 3. To disable an item , simply move the switch. TuneUp StartUp Manager is able to identify many common popular programs and startup , and tells you if they are not needed, as in the example of the Quick Start Adobe Reader, or programs are actually needed . 4. If you do not know what any of the programs listed, simply click on the “Details ” pane on the right side and see a description or even a link to view the details online. In a modern Surface Pro with 150 installed programs we find that the start time jumps just 7 seconds to almost a minute. TuneUp Utilities is able to restore the startup time almost to its original state . Depending on the number of startup programs that load automatically by the system, can greatly reduce the time of startup. Anyways, without unnecessary garbage running in the background, your computer will run much better.